Pasadena, Calif. – Researchers using NASA's Spitzer Space Telescope have learned what the weather is like on two distant, exotic worlds. 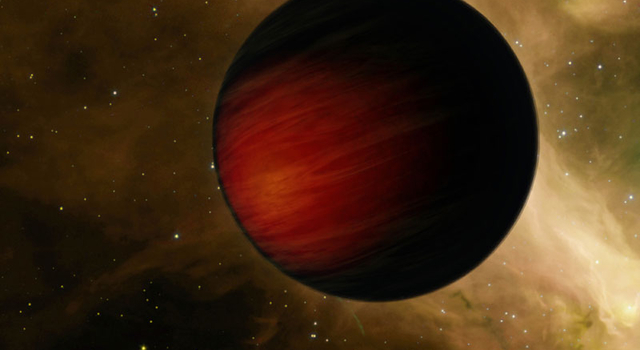 One team of astronomers used the infrared telescope to map temperature variations over the surface of a giant, gas planet, HD 189733b, revealing it likely is whipped by roaring winds. Another team determined that the gas planet HD 149026b is the hottest yet discovered. Both findings appear May 9 in Nature. "We have mapped the temperature variations across the entire surface of a planet that is so far away, its light takes 60 years to reach us," said Heather Knutson of the Harvard-Smithsonian Center for Astrophysics in Cambridge, Mass., lead author of the paper describing HD 189733b. The two planets are "hot Jupiters" - sizzling, gas giant planets that zip closely around their stars. Roughly 50 of the more than 200 known planets outside our solar system, called exoplanets, are hot Jupiters. 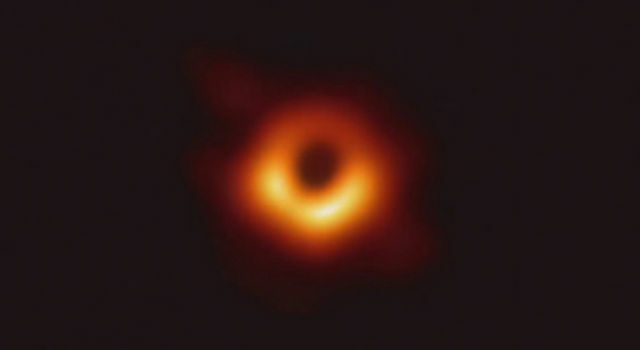 Visible-light telescopes can detect these strange worlds and determine certain characteristics, such as their sizes and orbits, but not much is known about their atmospheres or what they look like. Since 2005, Spitzer has been revolutionizing the study of exoplanets' atmospheres by examining their infrared light, or heat. In one of the new studies, Spitzer set its infrared eyes on HD 189733b, located 60 light-years away in the constellation Vulpecula. HD 189733b is the closest known transiting planet, which means that it crosses in front and behind its star when viewed from Earth. It races around its star every 2.2 days. Spitzer measured the infrared light coming from the planet as it circled around its star, revealing its different faces. 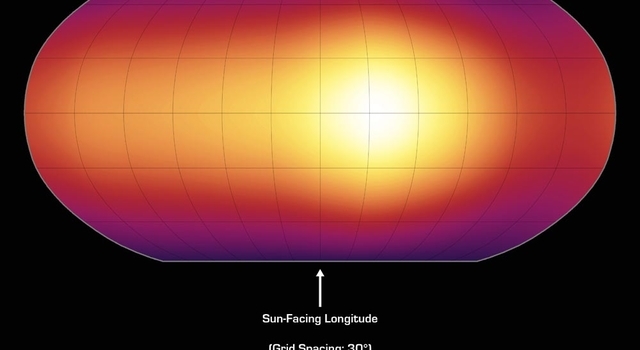 These infrared measurements, comprising about a quarter of a million data points, were then assembled into pole-to-pole strips, and, ultimately, used to map the temperature of the entire surface of the cloudy, giant planet. The observations reveal that temperatures on this balmy world are fairly even, ranging from 650 degrees Celsius (1,200 Fahrenheit) on the dark side to 930 degrees Celsius (1,700 Fahrenheit) on the sunlit side. HD 189733b, and all other hot Jupiters, are believed to be tidally locked like our moon, so one side of the planet always faces the star. Since the planet's overall temperature variation is mild, scientists believe winds must be spreading the heat from its permanently sunlit side around to its dark side. 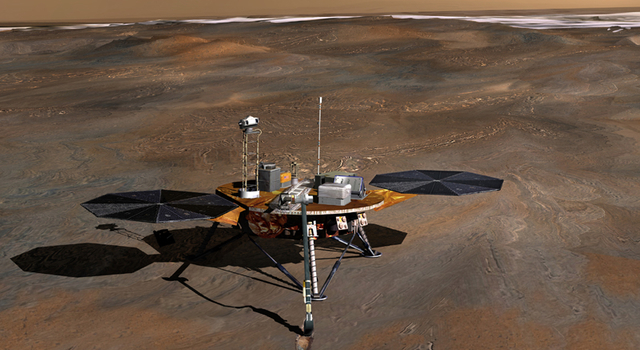 Such winds might rage across the surface at up to 9600 kilometers per hour (6,000 miles per hour). The jet streams on Earth travel at 322 kilometers per hour (200 miles per hour). "These hot Jupiter exoplanets are blasted by 20,000 times more energy per second than Jupiter," said co-author David Charbonneau, also of the Harvard-Smithsonian Center for Astrophysics. "Now we can see how these planets deal with all that energy." Also, HD 189733b has a warm spot 30 degrees east of "high noon," or the point directly below the star. In other words, if the high-noon point were in Seattle, the warm spot would be in Chicago. Assuming the planet is tidally locked to its parent star, this implies that fierce winds are blowing eastward. In the second Spitzer study, astronomers led by Joseph Harrington of the University of Central Florida in Orlando discovered that HD 149026b is a scorching 2,038 degrees Celsius (3,700 Fahrenheit), even hotter than some low-mass stars. Spitzer was able to calculate the temperature of this transiting planet by observing the drop in infrared light that occurs as it dips behind its star. "This planet is like a chunk of hot coal in space," said Harrington. "Because this planet is so hot, we believe its heat is not being spread around. The day side is very hot, and the night side is probably much colder." HD 149026b is located 256 light-years away in the constellation Hercules. It is the smallest and densest known transiting planet, with a size similar to Saturn's and a core suspected to be 70 to 90 times the mass of Earth. It speeds around its star every 2.9 days. 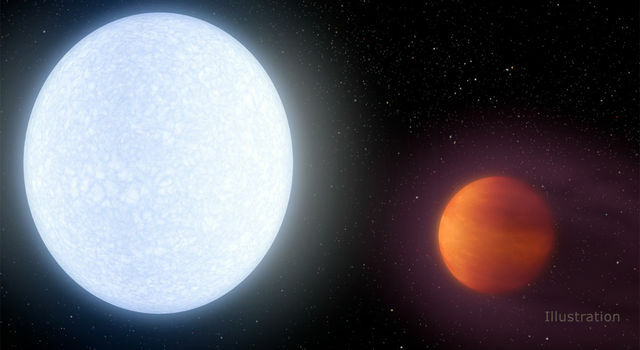 According to Harrington and his team, the oddball planet probably reflects almost no starlight, instead absorbing all of the heat into its fiery body. That means HD 149026b might be the blackest planet known, in addition to the hottest. "This planet is off the temperature scale that we expect for planets," said Drake Deming, a co-author of the paper, from NASA's Goddard Space Flight Center, Greenbelt, Md. NASA's Jet Propulsion Laboratory, Pasadena, Calif., manages the Spitzer Space Telescope mission for NASA's Science Mission Directorate, Washington. Science operations are conducted at the Spitzer Science Center at the California Institute of Technology, also in Pasadena. 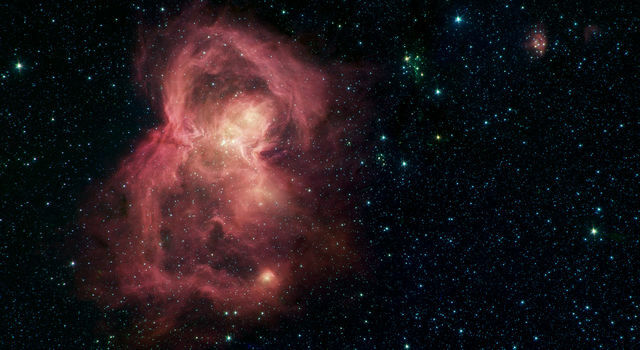 For more information about the Spitzer Space Telescope, visit www.spitzer.caltech.edu or http://www.nasa.gov/spitzer .